Harvard University researchers have made the first entirely 3-D-printed organ-on-a-chip with integrated sensing . 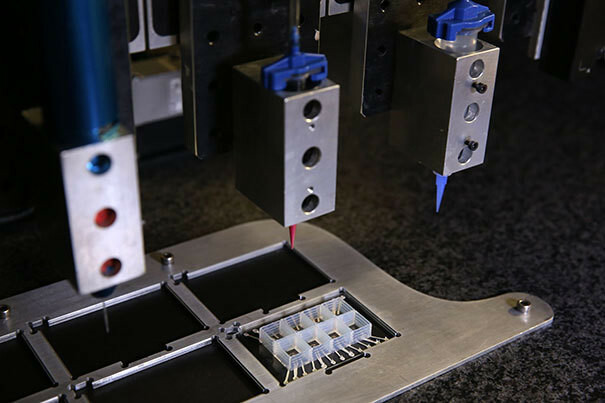 Built by a fully automated, digital manufacturing procedure, the 3-D-printed heart-on-a-chip can be quickly fabricated and customized, allowing researchers to easily collect reliable data for short-term and long-term studies. The research is published in Nature Materials . “This new programmable approach to building organs-on-chips not only allows us to easily change and customize the design of the system by integrating sensing but also drastically simplifies data acquisition,” said Johan Ulrik Lind, first author of the paper, postdoctoral fellow at the Harvard John A. Paulson School of Engineering and Applied Sciences (SEAS), and researcher at the Wyss Institute for Biologically Inspired Engineering at Harvard University . “Our approach was to address these two challenges simultaneously via digital manufacturing,” said Travis Busbee, co-author of the paper and a graduate student in the lab of Jennifer Lewis , Hansjorg Wyss Professor of Biologically Inspired Engineering, core faculty member of the Wyss Institute, and co-author of the study. “By developing new printable inks for multimaterial 3-D printing, we were able to automate the fabrication process while increasing the complexity of the devices,” Busbee said.